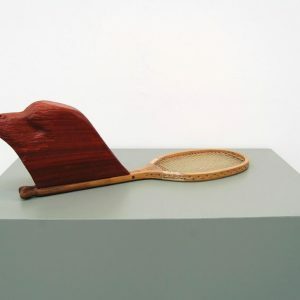 Until 17th June, the Attenborough Arts Centre in Leicester is hosting In Out There – a Shape Arts exhibition showing the work of four artists, which draw from the legacy of Adam Reynolds. Review by Jenni Hunt. 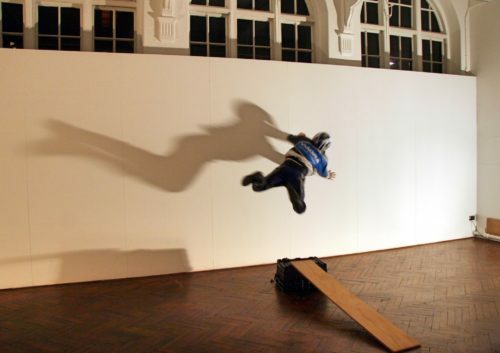 Adam Reynolds (1959-2005) was a curator, activist, gallery owner, mentor and disabled artist, who helped shape the UK’s art scene during the 1990s. After his death, Shape Arts set up the Adam Reynolds Memorial Bursary in his honour. 2018 marks the tenth occasion the bursary has been awarded, and In Out There consists of new work by Terence Birch, Sarah Carpenter, Nicola Lane and Catherine Cleary, all of whom have been shortlisted for the award. 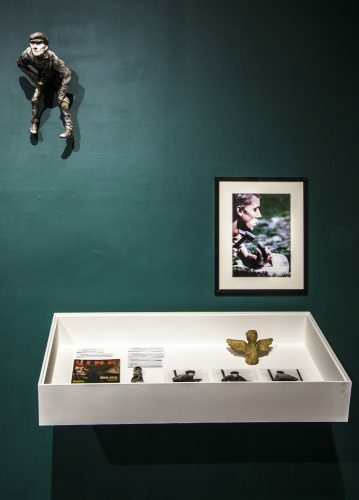 Their work interacts with conceptions of disability and is shown here alongside Reynold’s own work and archival material relating to the history of The Adam Gallery. 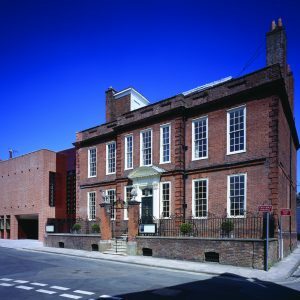 The Attenborough Arts Centre is an ideal venue for In Out There, as for twenty years it has been working on ensuring access to the arts for all. In addition, it was able to provide a large gallery space for this exhibition. I attended the artist conversation and publication launch, held on the 3rd May, and all four artists commented on the impact that the space had on their work. 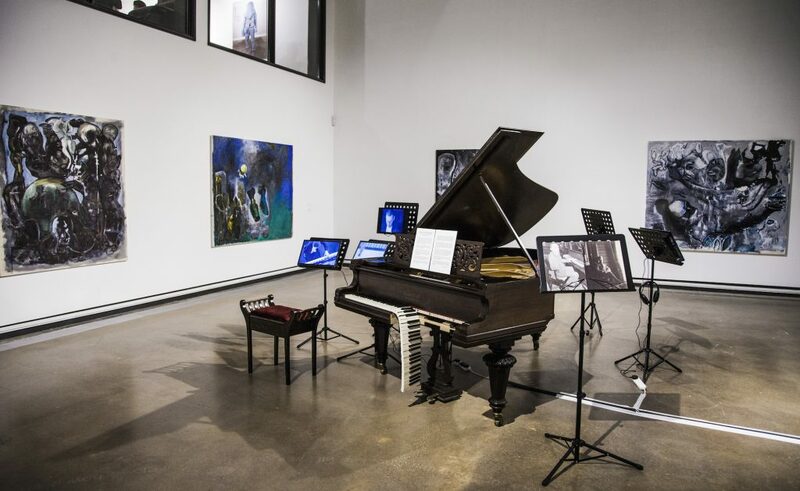 This was particularly clear when looking at Nicola Lane’s work, who responded to this striking space with a full size grand piano, modified so that half of the keyboard hangs detached in the empty air. Monument to Incompleteness #6 was made in homage to the pianist Paul Wittgenstein’s empty sleeve as he played Maurice Ravel’s ‘Piano Concerto for the Left Hand’ following the loss of his right arm during World War One. This piece – a mixture of explanatory text, the aforementioned piano, and clips of the music and video, left me with the sense of a greater understanding of this event. Prior to this I was vaguely aware that there had been a one-handed pianist, but this piece presented the unexpected. Its sheer scale evokes high profile public performance, and a history of disability art which refuses to be hidden away. I was particularly moved by the title of Terence Birch’s piece, Grotesque Torso (Oh Richard, Darling, You Can Prove a Lover), a proud acknowledgement of disabled sexuality and a challenge to Shakespeare’s Richard III’s declaration that “since I cannot prove a lover, to entertain these fair well-spoken days, I am determined to prove a villain” a line which has always personally rankled. Each of the artists at the conversation spoke of how the space they were given affected their practice, and how it was an opportunity to consider their process – Terence Birch talking of how he used this to challenge stereotypes he had internalised at a young age, and Catherine Cleary talking of how she was able to create on a larger scale and in doing so increase the detail of her work, transforming paint and being able to truly step back and explore the use of colour. For Sarah Carpenter it is the title of the exhibition which proved her inspiration, as she merges graphic design and photographs, along with exploration of the use of 3D structures. 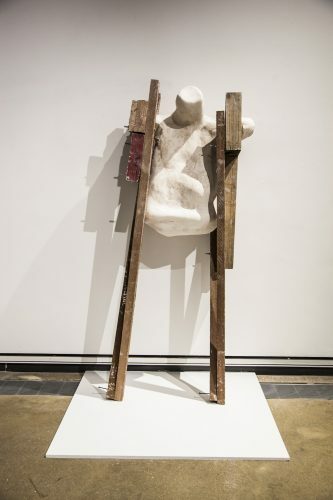 The exhibition shows Adam Reynold’s own work in a reconstruction of his gallery, and like the work of the other artists, there is a sense of transmutation here – of alchemy as one material becomes another. Adam Reynolds always wanted to ensure “echoes of experience” in his work, and this can be seen in the creativity of all those showcased. All of these artists identify as disabled people. This does not define them but is a part of who they are, which is conveyed through their work – at points consciously and at other points not. Through the process of creating t hese artworks these artists have been able to convey something meaningful about their lives, in the way that Adam Reynolds did within his own. 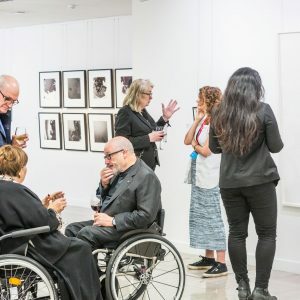 When the creation of art can often be isolating, both this exhibition and the Adam Gallery enabled disabled artists to interact with each other and build necessary support networks, as well as gaining new forms of inspiration. 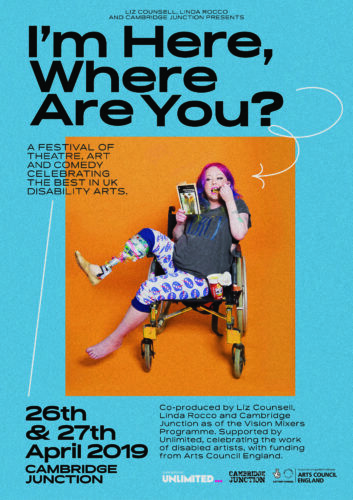 This exhibition is well worth a visit, and it is exciting to see the work of disabled artists centre-stage within a major gallery, whilst also connecting to the too-often unknown history of Disability Art.